Has Vodafone & Airtel really countered Jio's offer? It is about 7 to 8 months for Jio in Telecom Industry and since the first day Airtel and VodaFone both launched back to back offers. So, today we are going to check how successful are Airtel and Vodafone's offers in comparison of Reliance Jio. As we all know every plan launched by Airtel was just a launch of old plan with a new name with slight or no modification. Also lots of offers which were launched by these operators was misleading and that is the reason customers are still angry. For ex, Airtel was advertising that Airtel to Airtel calls are free while in reality we have to pay for that facility. Recently Vodafone has launched a new offer in which you can get unlimited 3G/4G internet at just Rs 16 but that offer is only for 1 hour. So far, Jio is the only operator who is providing more than enough data to its customers. We already know that there is no comparison of Jio Happy New Year offer with any operator on this earth. It is because Jio Happy New Year offer is totally free till 31st march with unlimited calls and SMS. So, we did a comparison of Airtel's Infinity Plan with Jio monthly plans and found that Airtel still very expensive for not so good service. Airtel is charging 549Rs for 1Gb monthly data to counter Reliance Jio's Rs 299 plan which gives you 6GB data along with Unlimited Night usage. Read more about: Airtel Vs Jio data plan. Now comparing with Vodafone, they were charging Rs 255 for 1GB data and since last month they are giving double data on all data plans. It means in Rs 255 you will be getting 1GB+1GB(extra). The other plan is Rs 459 for 3GB regular data and 3GB extra as a promotional offer. So, in this plan you are paying Rs 459 to get only 6GB data while Jio is giving 6GB data in just rs 299 along with unlimited night data, Unlimited voice calls and SMS. Speed is what we all prefer if we are heavy data users. Since launch of Jio, customers has been enjoying unlimited 4G data without any limit which made everyone fully digital. As reliance Jio is in test phase and customers are getting unlimited data usage, it leads to slow internet speed in some areas. No doubt Jio became 3rd fastest 4G provider in most cities according to TRAI APP and we know the reason behind was few customers who were using data in excess and now Jio offers unlimited data with 1GB daily FUP. Still 1GB data daily is a decent amount for above average users and this 1GB FUP limit is the reason that Jio Data Speed is now on TOP in all major cities. Now look At the below screenshots which are taken from TRAI MYSPEED. Jio 4G speed is now way better than Airtel and Vodafone. Reliance Jio is a PAN India Network means Jio services and network are available in all circles of India. Jio is the only pure 4G network of India. It is the only VoLte network while other operators are still giving LTE service. Do you know LTE is only data supported network means you can only use internet on LTE and if you are doing calls it will shift to 3G or 2G and this shifting of 4G to 3G/2G is giving a bad user experience and too much battery consumption. That is the reason for evolution of VoLte which can connect your calls without shifting your network to 3G/2G and it is also battery efficient. So, Jio is best if you are comparing it for good network coverage, connectivity, HD Voice, and No call drop issue. Comparing Airtel with Jio, It is clear that Jio apps are widely popular and are best in the market. 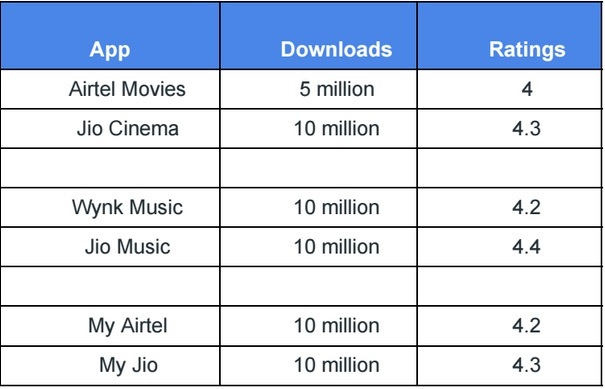 Ratings and downloads of Jio Apps are higher than Airtel apps. Check out below App comparison. It shows that the popularity for Jio App is higher with better ratings. Reliance Jio Services are best and world class. Jio brings revolutionary e-KYC verification process for faster customer verification. Jio Customer care is very friendly and they always solve your problems without a delay. While other operators are still trying to learn how to give quality service from Jio. Jio now a days working as 1G only .. Their customer care also do nothing except adding complaint. No reply available on our issues. It will lead it do fail offer soon.